America is in the midst of a Bourbon boom. Producers are finishing this spirit in wine casks, using hyper-local ingredients and other innovative techniques to create whiskeys you are going to want to try. The Bourbon boom is real. For this month’s reviews, we focused on bottlings released within the prior 24 months. 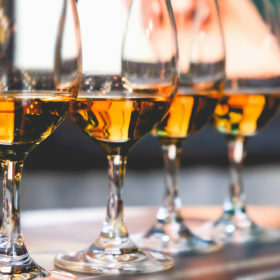 While there’s no shortage of old favorites on the shelves, Bourbon producers are clearly doing their share to meet continuing strong demand for America’s home-grown whiskey, bringing a veritable amber-hued flood of new bottlings to market. Kentucky remains Bourbon’s spiritual home, and it’s no coincidence that two top-scoring bottlings come from the state: Wild Turkey’s Master’s Keep Revival and Barton’s 1792 Bottled in Bond. At the same time, it’s worth noting that Bourbon is made all over the country, and that’s helped drive an increase in whiskeys made from hyper-local grains. For example, Wisconsin’s Border Bourbon is made with grain sourced eight miles from the distillery; Brooklyn’s Breuckelen Distilling uses a measure of malted barley grown on New York farms in its Project No. 1 Bourbon; Virginia’s KO Bare Knuckle Bourbon and Vermont’s Burnt Rock Bourbon both use grains sourced in their respective states; and Philly’s New Liberty Bloody Butcher Bourbon is distilled from Pennsylvania’s own red-hued Bloody Butcher corn, an heirloom variety. Finally, wine lovers may take particular interest in Bourbon right now, as a growing number of producers are finishing their Bourbons in casks that previously held wine—and they’re more successful than some previous attempts. For example, Hillrock’s Solera Aged Bourbon is finished in former Pinot Noir barrels from Napa. Meanwhile, Tommyrotter Distillery has released a Bourbon that sees time in “freshly emptied” barrels used to make Heritance George III Cabernet Sauvignon. These and other innovations in the whiskey space are sure to propel the Bourbon boom even further ahead. Keep that branchwater at the ready.